Emerging markets’ firms are ever more central to world trade. In 2012, trade in developing countries accounted for 38% of global flows—up from 14% in 1990, according to the McKinsey Global Institute report, “Global Flows In A Digital Age,” published in April. But unmet demand for trade finance capacity in emerging markets is making it difficult for small and medium-size enterprises to meet their financing needs, which may stymie their ability to grow. Trade finance backs global flows by offering importers and exporters the ability to obtain much-needed funding while mitigating counterparty risk. 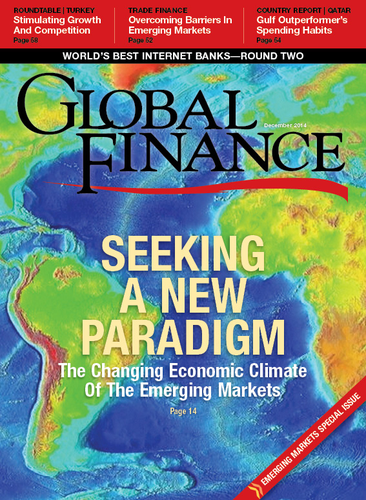 A report published by the Bank for International Settlements in January estimates that trade finance directly supports about a third of global trade and is “primarily used to finance trade involving emerging markets economies (EMEs), particularly in Asia.” The report states that in China, for example, trade finance backs 47% of merchandise trade. The lack of clear regulation... is leading to unintended consequences and is increasing the market gap for trade finance—which ultimately results in less trade and less economic growth. Sehgal notes that there is increasing investment in infrastructure by some emerging markets economies, as well as growing demand for commodities as expanding populations become more affluent, thereby consuming more. Both of these trends are driving EM growth, which in turn is a key driver of global growth. A report published last year by Ernst & Young, “Hitting the Sweet Spot: The Growth of the Middle Class in Emerging Markets,” predicted that the global middle class will expand by three billion people in the next 20 years, with most of this growth coming from emerging markets. Banks are increasing investment to these areas. Constantinides says HSBC is focusing on the shift from traditional trade products, such as letters of credit, to open account terms. “We’ve been building out to support open account with our receivables finance and payables finance structures and have been putting new technology and solutions into the market with that,” he says.